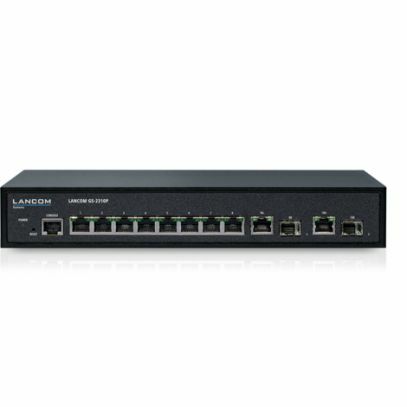 The LANCOM GS-2310P+ is a reliable component for smaller modern network infrastructures at small or home offices. It networks up to 10 devices with its 8 Gigabit Ethernet ports and 2 combo ports (Ethernet or fiber-optic). This switch supplies an overall output of 130 Watts and is also capable of powering all PoE devices connected to it (as per IEEE 802.3af/at) without any additional power supply units or cabling. Equipped with numerous security features and a high-performance hardware platform, it is ideal for the secure and reliable networking of smaller networks.